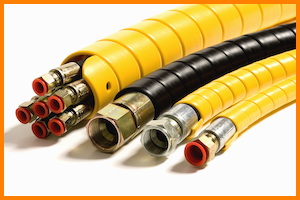 SafeEdgeä abrasion protection HDP spiral wrap is simply wrapped over hydraulic hose, pneumatic lines, wires or cable to provide tough protection for abrasion and wear protection. Used to protect brake air lines, fuel lines, hydraulic lines on mobile hydraulic equipment. Protects wires, cables and hoses from impact damage, crush damage, cuts and general abrasion from dragging on floors, or outdoors.